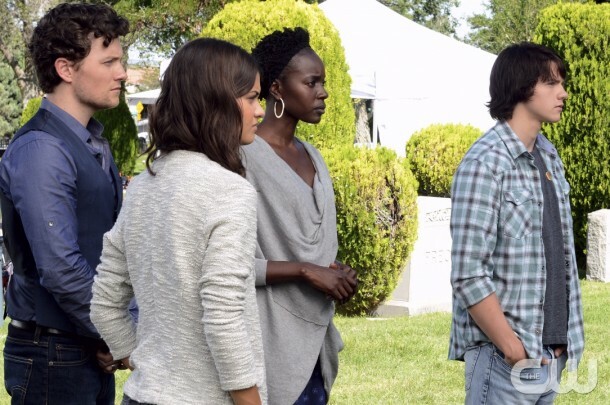 The Messengers — “Path to Paradise” — Image Number: MES103a_0193.jpg — Pictured (L-R): Jon Fletcher as Joshua Jr., Sofia Black-D’Elia as Erin, Anna Diop as Rose and Joel Courtney a Peter — Photo: Ursula Coyote/The CW — ÃÂ© 2015 The CW Network, LLC. All rights reserved. Tonight at 9/8c, watch an all-new episode of The Messengers. Will all be lost if The Messengers stray from their path? Vera’s gift will finally be revealed. Executive Producers Eoghan O’Donnell and Trey Callaway talk tonight’s new The Messengers. Will all be lost if The Messengers stray from their path? Vera’s gift will finally be revealed. Executive Producers Eoghan O’Donnell and Trey Callaway talk Friday’s new The Messengers!